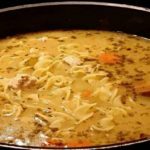 – In a large soup pot, saute onion in olive oil until translucent. 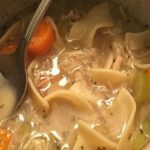 -Fill pot 2/3 full with hot water and add bouillon cubes (I usually use 3 or 4)- you could also use canned chicken broth. 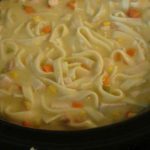 -Bring to a rolling boil and add bag of egg noodles. 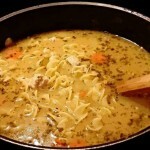 -Boil until noodles are tender (approx. 12-15 minutes), and stir occasionally. -Sprinkle parsley flakes on top and serve!!! 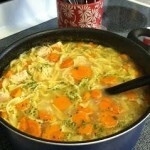 (Don’t skip out on the parsley flakes- it really adds to the “homestyle” look of the soup. 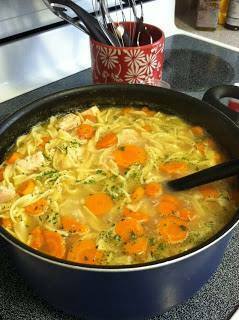 Almost As Fast As…But Way Better Than Canned Chicken Noodle Soup!